Early years: Growing up in Bombay (India), ours was a middle-class family and that family life is the foundation of my current values and outlook towards life. I was a pretty average student until the 8th grade. It was then that I woke up to my love for science and math. I was inspired to pursue the field of Mechanical Engineering because of my dad (Mech. Eng. faculty). I went on to complete my Bachelor's in Mechanical Engineering (Batch of 1999) with the distinction of being a Gold Medalist from the University of Bombay. Manufacturing & Design Experience -- Tata Motors, India: After my undergraduate studies, I was selected by TATA Motors - one of the leading automotive manufacturers in India (www.tatamotors.com). My first year at the company was that of an intensive training during which I had classroom inputs in management skills, KAIZEN, design of experiment methodologies, vendor development etc. But then training apart, the shop floor provided me the best opportunity to hone my engineering and managerial skills. My assignments with various departments helped me understand some of the important aspects of running an industry, right from production planning to development of third party logistics. After the training period I was working for a year with the Quality & Process Management team in the Engines Assembly and Testing shop. Graduate Studies -- University of Illinois: After the first two years of being in the automotive industry, I decided to pursue my graduate studies in Industrial Engineering, which is what brought me to the United States in the Fall of 2001. I did my M.S in Industrial Engineering from the University of Illinois, Urbana Champaign during the time frame of 2001-2003. My thesis dealt with the application of revenue management strategies to the allocation of manufacturing capacity (Thesis advisor Dr. Wen Zhao). After the completion of my M.S. degree, I stayed on for my Ph.D. work at the University of Illinois under the guidance of Prof. Richard E. DeVor and Prof. Shiv G. Kapoor. My doctoral dissertation was titled "Fundamental study of the machinability of carbon nanotube composites". It was during my doctoral student years that developed a love for students and teaching. The four teaching stints that I had with the Mechanical Engineering Dept. further confirmed my desire to be in the academic world. My Spiritual Life: Like a majority of my contemporaries, I was complacent about matters of faith for most of my formative years. In fact , I never had much of a spiritual life at all - for me academic achievements were everything. Never did I stop and ponder to think What do I believe in? or may be pose questions such as Is there a God? Who is God? Is He relevant to my life in the 21st century? What is the meaning and purpose of my life?. In the Fall of 2002 (second year of my MS program), through a set of events in my personal life, I was brought to a point where the above questions became burning issues for me. For the first time in my life I was honestly seeking answers to those questions. 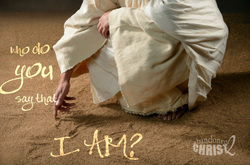 That journey culminated in me finding answers in the person of Jesus Christ. My relationship with Him is the greatest thing that I value in my life. If interested, you can read more of the details of my journey of faith by CLICKING HERE. 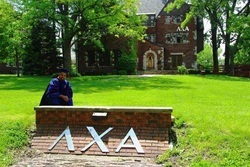 Lambda Chi Alpha Fraternity : My association with the Lambda Chi Alpha fraternity started in 2007 with the "Beer & Bible" discussions held in the Chi Zeta Chapter at the University of Iliinois. This was an open forum that allowed for the brothers in the house to openly question and investigate spiritual matters for themselves. My association with that house started when I was invited by the alumni advisor, Steve parsons, to be a guest for one of the "B n B" discussions. That night I had a chance to share my spiritual journey with the students there and I was blown away by the honest questions that the students were asking me. It reminded me of my own search for answers back in 2002. Their spiritual curiosity brought me back to the chapter house every Monday night. Over the course of that year many life-changing friendships and mentoring relationships were formed. Given my close association with the members of the house, the Chi Zeta chapter gave me the privilege of being the first honorary graduate student initiate in 10 years. I also currently serve as one of the faculty advisers for the Epsilon Eta chapter at Rensselaer. Rensselaer TALKS -Spring 2014 : The Spiritual Dimension of Life: Is it Worth Investigating? Beer and Bible from City on a Hill Productions on Vimeo. A video shot by City on a Hill Productions when they dropped by the spiritual discussion group at the LXA fraternity house at the Univ. of Illinois - Fall 2009.